4. The Spanish infantry and artillery often fights well, but is overwhelmed. So, of course, when I was looking to start my AB Spanish army where else would I look than a cavalry regiment! Not only a cavalry unit, but one that is not even in the AB Spanish range. This range includes Dragoon and Cazadores, but no Hussars. 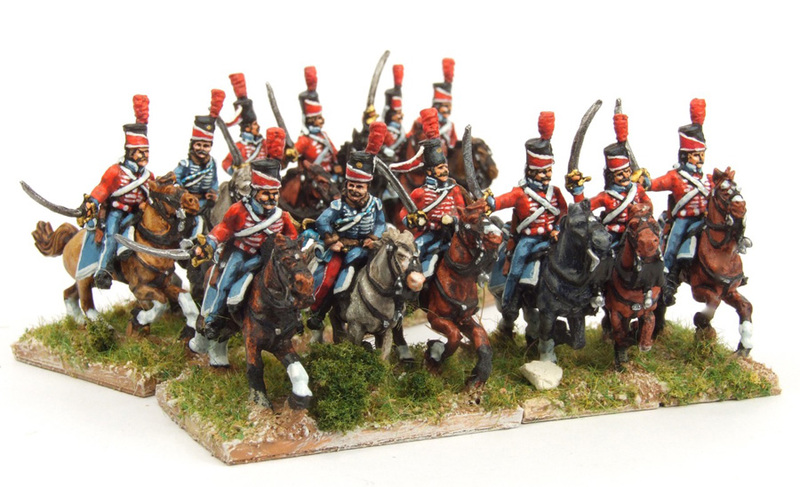 I had been looking for an excuse to use some figures from the AB Jena Prussian range (IMHO, Tony Barton's finest) and found to my delight that the Spanish regular army had two hussar regiments at the start of the Peninsular War. Apparently the pelisse worn by the regiment had the unusual feature of epaulettes on the pelisse, rarely seen in a hussar uniform. If you are feeling especially clever, you can add these with a bit of green stuff, but I wasn’t fussed. I couldn’t find any references to trumpeter uniforms, so went with the typical reversed arrangements. In theory, the Maria Luisa Hussars has five 70-men squadrons, but Spanish cavalry regiments in most Peninsular OBs rarely appear to have more than 1-2 squadrons strong. In fact one of the attractions from a painting/collecting point of view is that you can accurately depict brigades comprised of five or six 1-2 squadron regiments. My own Maria Luisa Hussars are two, 6 figure squadrons based on a 1:20 scale. As far as service record goes, the Maria Luisa Hussars were swept up in the rapid destruction and reorganisation of the Spanish armies and some recent thinking is that they were reorganised as the 1st and 2nd Húsares de Extremadura, later combined into one regiment. From a gamer’s perspective, they are handy as they fought at Albuera. Many gamers use the Spanish OB from Albuera as a generic Spanish force to add onto a British division or two as it contains a mix of units, including some better quality ones such as Spanish and Walloon Guards and the Irish Regt. So the end result is a unit that can be deployed alongside your Brits at Talavera and Albuera or take part in the debacles of Medellin or Ocana. I usually paint horses using the ‘wipe-off’ method. This involves a white undercoat, base colour (light browns, flesh, ochre, sand, even yellow and buff), then slap on water-based oils . If you haven’t used these, try them as they are a whole lot more usable than traditional oils. The take a piece of tissue paper and wipe off the oil paint. It leaves both a lovely shadow and sheen effect. Antispam protection : Are you a spam robot?